The break statement, which was briefly introduced with the switch statement, is used to exit a loop early, breaking out of the enclosing curly braces. We already have seen the usage of break statement inside a switch statement. The continue statement tells the interpreter to immediately start the next iteration of the loop and skip the remaining code block. 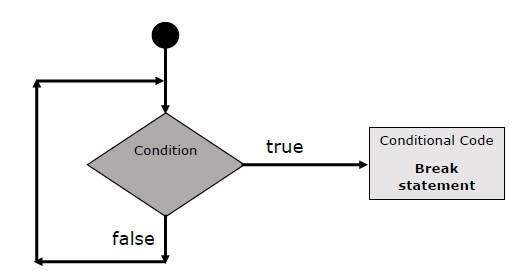 When a continue statement is encountered, the program flow moves to the loop check expression immediately and if the condition remains true, then it starts the next iteration, otherwise the control comes out of the loop. Note − Line breaks are not allowed between the ‘continue’ or ‘break’ statement and its label name. Also, there should not be any other statement in between a label name and associated loop. Try the following two examples for a better understanding of Labels. The following example shows how to implement Label with a break statement.